There's been a bit of colds and sniffles around here, which has prompted me to pick up some of those pocket packs of tissues. I keep some in my purse, put some in my kids' backpacks, etc. 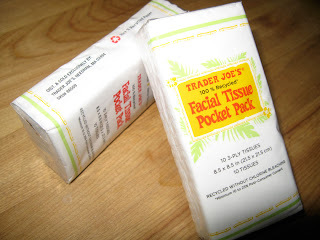 I recently found that at Trader Joe's those little packs are filled with recycled paper tissues. Hooray! I always thought it was strange that you can buy recycled paper tissues in larger boxes but not those pocket packs. Typically only virgin and bleached tissues are found in the little packs of Kleenex (or store brands like Target). I was so excited to have the option of choosing a greener tissue. I know that the fact they are disposable and in little packages isn't the most environmentally sound choice, but when one is having a major situation in sinus-land, it is hard to imagine how many cloth handkerchiefs one would need to tote around. At this rate I'd need an extra purse! Of course, if we were REALLY die-hard we'd use handkerchiefs...well, maybe my son is doing that...using his sleeve, right?